The ideal in-flight reference list! Sometimes you need all the checklist information in a quick-reference format. FlightCheck checklists offer just that. The comprehensive and well-organized avionics procedures checklist for Bendix-King Portable GPS units. The comprehensive and well-organized avionics procedures checklist by Qref Media. The comprehensive and well-organized avionics procedures checklist for the Garmin GTN 650/750. The comprehensive and well-organized avionics procedures checklist for Garmin Aera and GPSmap Series Portables. The comprehensive and well-organized avionics procedures checklist for Garmin 400, 430, 530 & 480. The comprehensive and well-organized avionics procedures checklist for Garmin Apollo equipment originally by UPS. The comprehensive and well-organized avionics procedures checklist for King KLN-94, KLN-89B & KLN-90B. 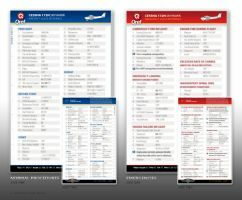 The perfect 5 x 9 inch checklist by Qref Media. The comprehensive and well-organized checklist by Qref Media.